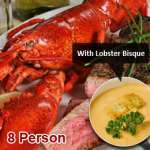 Our Surf and Turf dinner for four comes with four live 1 ¼ lobsters and four 6 oz. premium aged filet mignons. Our Classic Bay Shore Lobster Bisque serves four (two 20 oz.) and is rich, creamy and bursting with flavor. Premium sweet lobster meat combined with spices, heavy cream, sherry and butter is pureed to a beautiful finish. 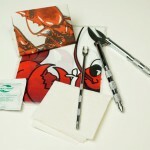 Live Maine Lobster Surf N’ Turf dinner shipped right to your door!